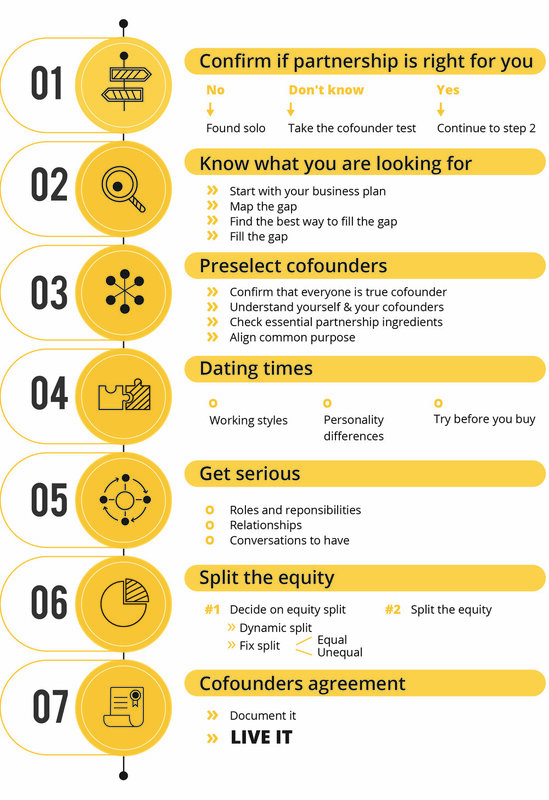 Cofounding is a set of tools (Book and Cofounder Agreements templates) and Services build around a proven Cofounding framework, developed by me, Jana Nevrlka. I am driven by the mission of “No more failed business partnerships!” and focus on helping founders build cofounding teams that win and last. And how does she know about cofounding? It all started when I simply realised that there must be a better way to do business partnerships. Since I had not found much knowledge or support available, I decided to fill the gap myself. With one successful and one failed cofounding experience behind me, I have spent past 5 years learning what’s required to build better business partnerships. Now I use this knowledge to help cofounders across the world to build successful and lasting businesses. Combining my legal and business background with the entrepreneurial experience, I write and speak extensively on the subject. I work as a cofounding expert for a number of startup accelerators, universities and VC's. In addition, I coordinate the development of dynamic equity split templates in Europe, in direct cooperation with Mike Moyer, author of the Slicing Pie! Scroll down to learn more about Slicing Pie. Why “cofound” in the first place? But they are very hard to get right. 70% of startups fail because of disagreements between founders. Why? Because cofounding isn’t as simple as drawing up an agreement and shaking hands on it. Get your cofounding team right, and you’ll be in the best possible position to handle any challenge that’s thrown in your direction. Get it wrong, and not even the best business idea will be able to survive. So why not to maximise the chances of your company to succeed? Want to learn more about cofounding, partnerships and how to get it right? "No more failed business partnerships"
Starting from creating awareness about the most common mistakes through to providing information on some of the most difficult decisions founders face – being equity splits – I support business partners and cofounding teams to get the basics right and be able to get the most from being partners. Based on the values of integrity, fairness, awareness and knowledge sharing: "I help founders build teams that win and last." Watch a video where I explain how to divide equity in a startup the legal and right way! Slicing Pie is often referred to as the fairest equity split, developed in the United States by Mike Moyer and based on the principle of dynamic split - adjusted for cofounders actual contributions. I am developing and coordinating slicing pie implementation options for cofounders in Europe, together with the following experts in different countries.